Kelly Samof – UPNG Economics Graduate and 2018 ANU-UPNG Scholarship recipient. Kelly Samof is quick to admit that when he started university he was thinking only of getting a degree and finding a job to secure his own future. Now Kelly’s face lights up when given the opportunity to speak about his studies in economics and his hopes for the future of Papua New Guinea. His tall frame moves excitedly to make each point. 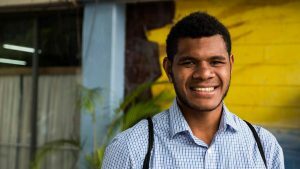 “Once I finish studying I want to work at the Central Bank of Papua New Guinea or the Department of Treasury,” Kelly said. Soon after starting his Bachelor of Economics at UPNG SBPP in 2013, Kelly found himself under the guidance of academics from the ANU through the Precinct. “The partnership between the two universities has had a big impact on both my education and my personal growth,” he said. Through the Precinct, the Australian academics teach a number of economics and public policy subjects including Applied Economics and Business Statistics, Economic Policy, Quantitative Economics, Intermediate Macroeconomics, Decentralisation Policy, and Policy Monitoring and Evaluation. Seconded ANU academic, Dr Manoj Pandey, celebrates graduation day with Kelly Samof. “The lecturers tell us that what we learn is on par with students in Australia and Europe, and they talk about the huge potential of our country,” he said. Kelly they were encouraged to see themselves as global citizens and not just as undergraduates. His credentials as a global citizen and an emerging leader were boosted when he travelled to Sydney in 2016 after being awarded a Kokoda Track Foundation Archer Leaders Scholarship, which aims to develop tertiary students who have demonstrated an unquestionable commitment to their studies, communities and country. Kelly once again reaped the benefits of his hard work when he was awarded the ANU-UPNG Scholarship in Economics in April 2017, which is supported through the Precinct partnership. The scholarship will see Kelly return to Australia in 2018. This time to Canberra where he will live for two years while he undertakes a Master of International and Development Economics at ANU. In Alotau and Port Moresby, Kelly’s family and friends continue to encourage him on his journey. “They’re supportive of the fact that I’m growing as a person and learning to interact with people from outside Papua New Guinea,” Kelly said. “It was a barrier that I had to break through, learning to communicate with people from a different culture. 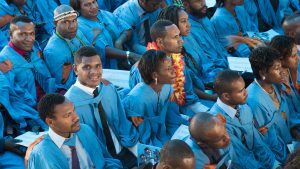 Kelly graduates with his School of Business and Public Policy peers at the 62nd UPNG Graduation Ceremony. 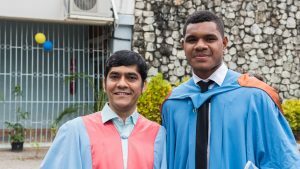 He is not the first in his family to excel academically with his father, Dr Lucas Samof, also graduating from UPNG. Dr Samof studied medicine, specialised as an anaesthetist and is presently Director of Critical Care and Medical Services of the Milne Bay Provincial Health Authority. Kelly’s younger sister may also look to follow in those footsteps when she joins him in Port Moresby to study science at UPNG, with a view to moving into medicine. Kelly is excited by the prospects of furthering his education and believes the education and experience he gains at the ANU can equip him with the tools to make a difference in Papua New Guinea. “I don’t expect to change the whole world, but I know I can play a part in shaping the future of Papua New Guinea by helping to create good policy and contributing to sensible economic decisions,” Kelly said.